FLYING SHOES reminds me what belonging to a community is all about. I’m laughing and having a good time with some of the other reviewers: some of us didn’t know quite what to expect. The book’s description speaks of an old child molestation and murder case: something dark that needs to be solved. But…then. We hear how Kroger’s has better produce; an Acid Reflux Pillow sells for $59.99. We hear about the family: everything about how they keep their rooms to the secrets they keep. We hear about the neighbors, and the people down the block, and the people across town. It’s lovely. So yes, this book is not for everyone. There are several characters involved here. Each of them are unique and whacky; each of them totally believable. 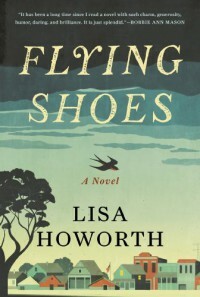 The quality of writing from Lisa Howarth (of Square Books, Oxford, MS fame) ties it all together wonderfully. One after another: metaphors, analogies, and even some hyperbole. It’s all personable, fun, and—again—lovely. I think you get the picture. This is a tribute to who we are. Whether the community is a small town in the Midwest (such as where I grew up), a group of book bloggers and reviewers, friends on Facebook, co-workers—anything—there’s always something going on and something to get into. We all bring something special to the table. In the end, the big issues may not get solved, but we’ve got plenty else to consume our time and talents with. So, don’t read this for the mystery or thrills. Just come on down and visit for a while. You’ll enjoy the zany individual stories and interconnectedness of it all. Thanks to Bloomsbury for offering a digital version of this book for my review.